She was born into the Ponca Nation, a Native American tribe originally from the Nebraska/South Dakota area, and which is now scattered throughout the U.S. Camp-Horinek lives in north central Oklahoma, where approximately 800 reside. Camp-Horinek hails from a large family. She’s been married 48 years and has four adult children, and over a dozen grandchildren. 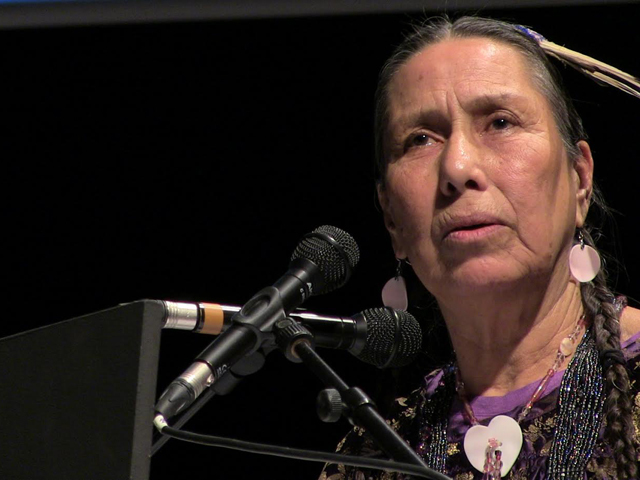 She describes a Taiwainese business that’s producing carbon, as well as Oklahoma gas lines, fracking, and earthquakes happening as a result of it, as “an environmental genocide” on her people. As a councilwoman, she’s one of seven trying to make an economic and cultural way forward for generations to come for her people. She says she would like them to have basic necessities like clean water to drink. What is one piece of advice you wish you could tell yourself when you were 20 with the wisdom you have now?